An integrated enterprise application for automating the functions of family offices, trust and company administration, fund administrators, yacht and aircraft management and other financial services businesses particularly those with sophisticated investment accounting requirements wherever you are in the world. 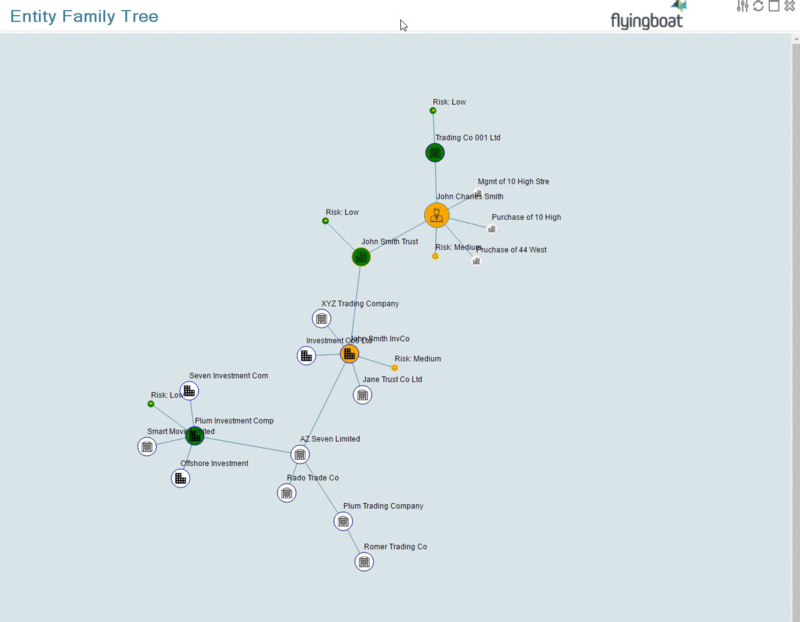 Flyingboat Wealth Management Software provides the functionality needed to automate a family office or wealth management business – catering for all aspects of managing the administered entities, the principal's and the family's affairs, or those of the clients, together with the network of third parties and advisors involved. It takes care of the accounting records, manages investments and portfolios, the statutory record keeping, compliance and regulatory functions. It keeps track of tasks and activities and manages the production of documentation and client reporting. It also runs your business or operating company to track the time expended with facilities to manage service charges and fee billing, debtor control and more. Over two decades of continuous development and update delivers an easy to use but sophisticated and powerful solution used by clients large and small in a variety of sectors of financial services and family office. with integrated Investment Portfolio Management and reporting. Maintain registers of statutory information including: Shares, Roles, Loans, Guarantees and in fact anything you need to record. Statutory document production and reporting. Entity Management : Compliance, GDPR, KYC, CDD, Regulatory Reporting. FATCA & CRS AEoI reporting - Payrolls – Personnel – Employment Schemes - Safe Custody Management and bespoke developments. 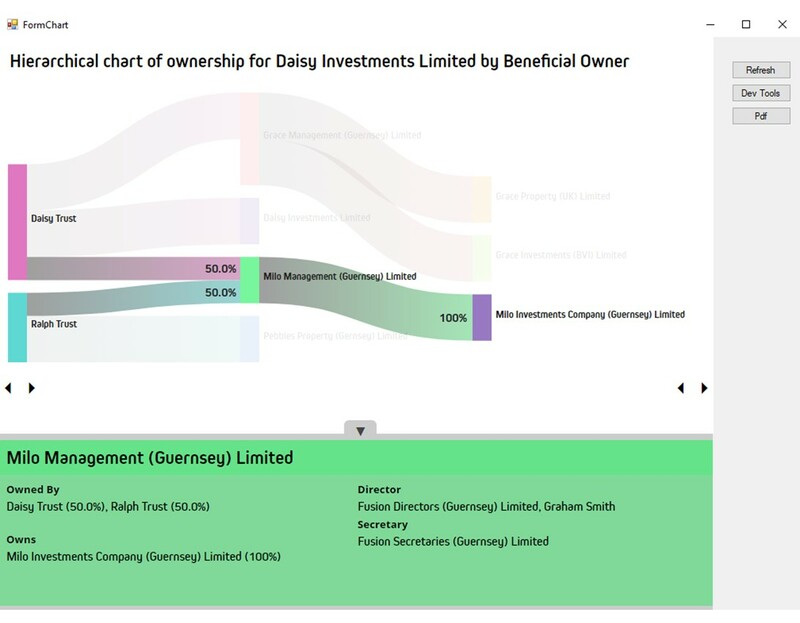 Interactive ownership chart - data drawn from Share Register data held within Flyingboat and always up to data. Excel ownership workbook supplements the chart and is esepcially useful in larger ownership structures. Flyingboat offers a powerful billing system and you can view and manage the entire billing process and history with all of the supporting detail from one screen. A powerful fully featured accounting system for managing the bookkeeping requirements of entities of all types including those with complex multi currency investment portfolios. 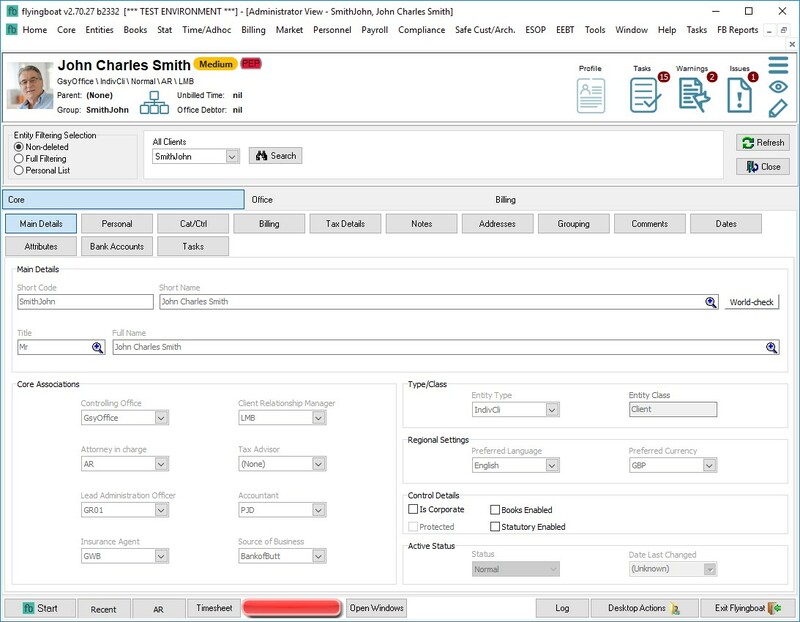 Rich depth of Customer Relationship and Entity details available in a set of easy to navigate screens. Graphical tools dynamically illuminate your data and provide interactive analysis functions - Spider Chart of an entity group. Quick and easy access to the registers for all of the company secretarial requirements for entities of all types. Bank Account details can be maintained for all entities even when you don’t manage the bookkeeping for the entity. A powerful database for tracking all of the people, administrated entities, in house companies, third parties you deal with along with investments, fixed assets and any other objects you need to keep records on. Alongside the database are the functions to assist administration and regulatory compliance – CDD/KYC/AML & Risk, GDPR, FATCA & CRS Reporting. Task Management and Diary functions help you efficiently run the business. A feature rich multi currency, multi entity accounting system with integrated investment and fixed asset accounting and investment reporting. 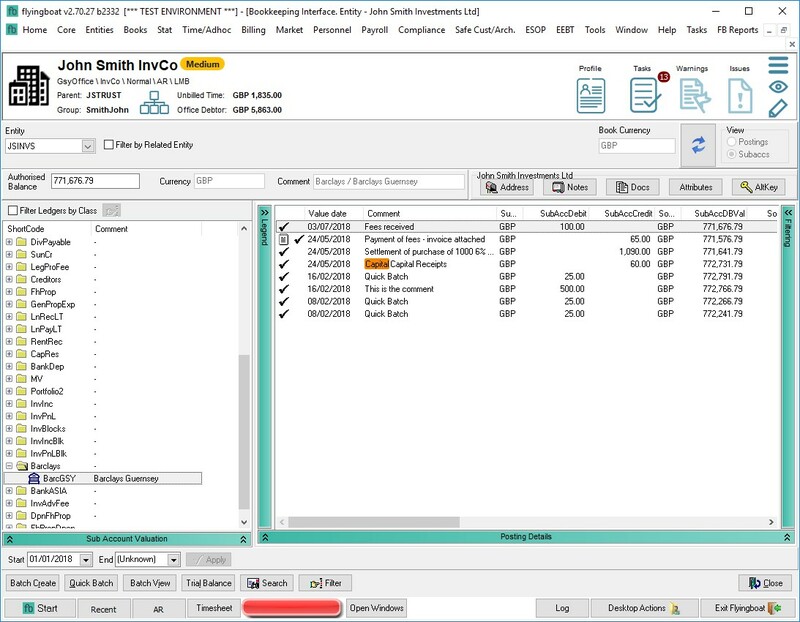 Developed specifically for the requirements of investment entities it is equally at home managing any entity accounting needs with full General Ledger, Credit & Debtor management. Integrates with fees and billing functionality, as well as feeds from Banks and Investment price sources to automate where possible. UK HMRC Making Tax Digital approved. Maintain all the registers and corporate records for any structure – Company, Trust, Foundation, Fund etc. Manage corporate actions, maintain multiple class Share Registers and more. Support for Regulatory and Compliance reporting – beneficial ownership, annual validation filing etc. Automated document and minute production. Flyingboat provides all of the tools to ensure you bill your clients for the services you provide them. Encompassing time recording, rate card services, disbursement management and fixed fees / service charges and asset value based fees. 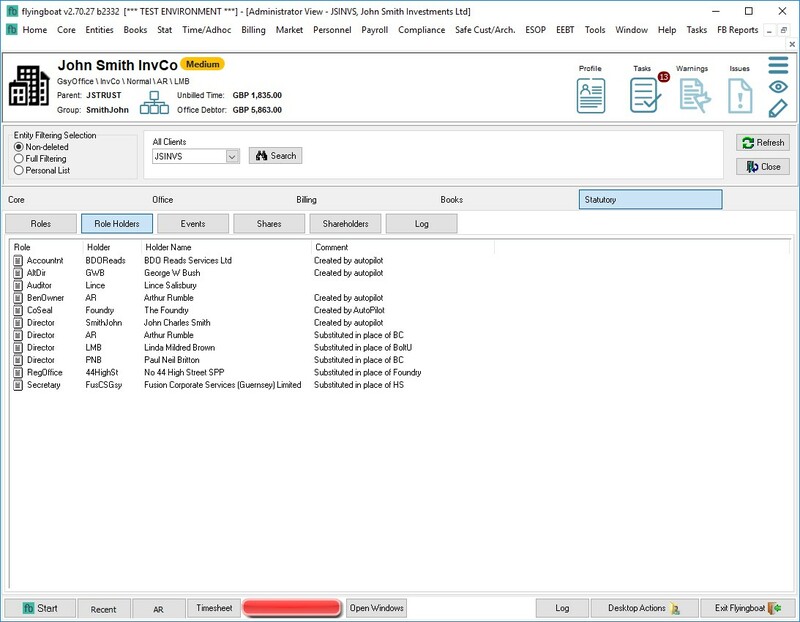 Integration with bookkeeping automates processing and debtor control. 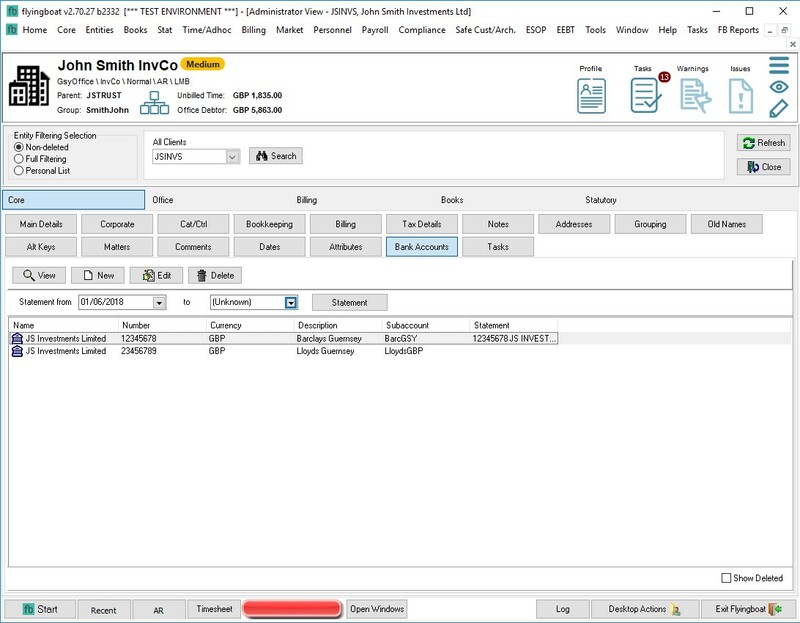 Billing functionality can also be used by administered entities. Flyingboat provides a comprehensive library of pre configured reports – all the types of reports you are likely to need often with numerous presentation of formatting options. 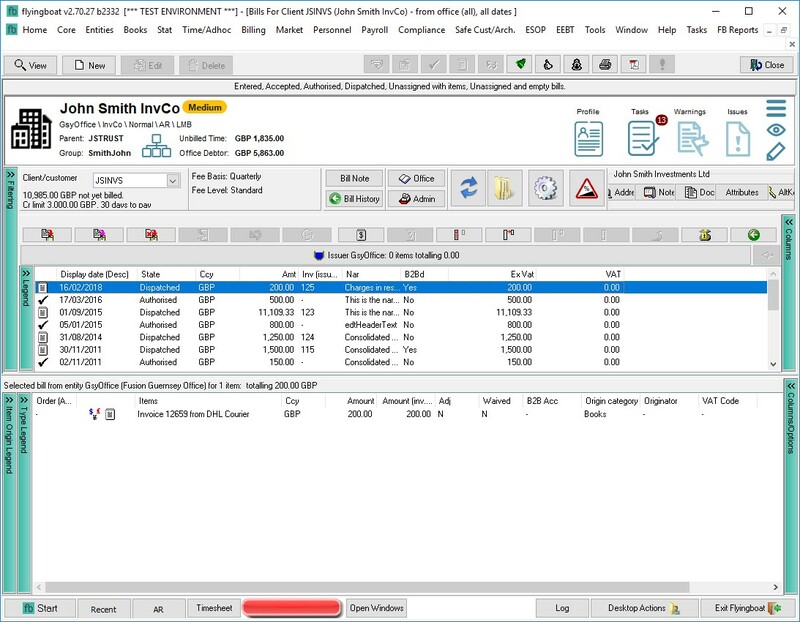 The software automatically supports client specific variants of common report styles including Invoices, Statements and Net Asset Statements. Flyingboat utilises the power of Microsoft Excel to enable dynamic reporting and analysis by driving data sets into Pivot Tables, Charts and other interactive data presentation styles. Document generation through Microsoft Word provides further options for improving your performance on paper. Subscribe to keep up to date with the latest Flyingboat developments & updates.